Confirmed: Tweetie 2 (Twitter) for Mac Is Coming! About an hour ago, we wrote up the hot rumor that Tweetie 2 for Mac would be launching alongside the Mac App Store tomorrow morning. 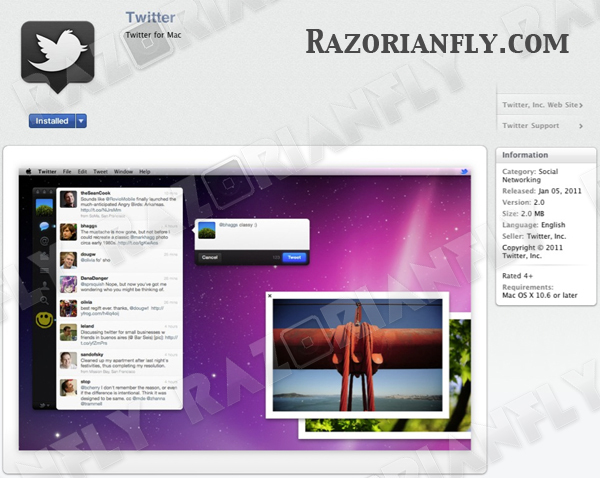 The source of that information was a site called Razorianfly which posted an image they received of the product, which is being renamed “Twitter for Mac”. We can now confirm that the screenshot is very real, we’ve heard from a reliable source. Further, we noted that Twitter was being unusually quiet about the image/news — they won’t respond to any inquiries about it! Well, there’s a good reason for that too. We’ve heard that the shot was actually leaked by someone within Apple and there’s currently a hunt underway to figure out who it was. That means Apple likely has both companies on lockdown. They are not happy. So when the Mac App Store launches tomorrow morning at 9 AM PT, expect to see Twitter for Mac there for download complete with native retweet support, realtime updating, and drag and drop tweets. And while we haven’t heard anything specifically about the pricing, I think it’s a safe bet that it will be a free download. Previously, Tweetie for Mac was free with ads or $19.95 to get it ad-free, but that changed when Twitter bought it. They also made Twitter for iPhone (formerly Tweetie) free.